Don’t delay an end to coal use. The UK has laid out a plan to phase out coal by the end of 2025. A coal phase-out is great news, but the plan proposed as a way to achieve it is not. 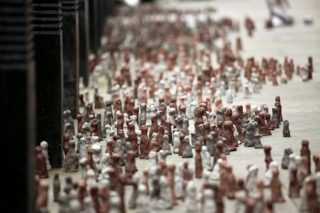 On 8 February, the final day of the coal phase-out consultation, Ditch Coal turned up at BEIS (the Deptartment for Business, Energy and Industrial Strategy) and set out 2,900 clay figures outside BEIS to acknowledge the lives which could be saved each year if we quit coal now. 1 – For the 2,900 people who will lose their lives each year from the air pollution caused by coal alone, 2025 is not soon enough. 2 – The plan makes no mention of the impacts of mining for UK coal in Russia, Colombia and the USA. The indigenous Shor people in Russia have been driven out of their villages and are victims of cultural genocide and state persecution due to the Russian mines which export coal to UK power stations. For these people, 2025 is not soon enough either. 3 – For the Colombian villagers who have been forcibly displaced as a result of UK mining interests, by companies which are allegedly complicit in paramilitary assassinations, 2025 is not soon enough. 4 – For the endangered species of the Appalachian mountain region in the USA, one of the most biodiverse regions in the world, 2025 will be too late to stop the open-top mountain removal mining that provides UK coal. For Alison, Chris and their community, 2025 is not soon enough. 6 – Co-firing coal with biomass is proposed as a solution. In terms of net climate change impacts, biomass is not always cleaner than coal. 7 – The government continues to offer power stations large payments in the Capacity Market Auctions so that they can stay open, and seek to prevent them from closing by threatening fines. Instead of working with the market conditions which could lead to an earlier coal phase-out, the government is propping up the industry. 8 – The plan states that it will not proceed to impose the end of coal by 2025 until the energy gap can be plugged elsewhere. Without proper investment in renewable energy, or serious efforts to reduce the UK’s demand for energy, the goal of 2025 could be pushed back and back on the basis that we ‘can’t meet demand’ without fossil fuels, although there is ample evidence to the contrary. 9 – There is also nothing in the plan about support for people who lose their jobs as a result of coal closures, other than ‘working with JobcentrePlus’. Here the government ignores the tremendous work of UK and international unions to articulate principles by which a transition away from fossil fuels should occur. Making a stand for these principles must also be the work of the climate justice movement, and the plan is incomplete without them. 10 – The plan is not legally binding, and the current wording allows a future secretary of state to postpone or suspend the arrangements. All in all, this is not a coal phase-out which meets the urgent needs of communities in the UK and abroad. It does not do enough to safeguard public health or workers’ rights. Even if it did, the government’s continued handouts to coal-fired power stations and lack of firm commitment in this plan mean there is potential for a 2025 phase-out to not be enacted. For more information about the Coal Action Network, click here.